Don Fortner sent in this one. 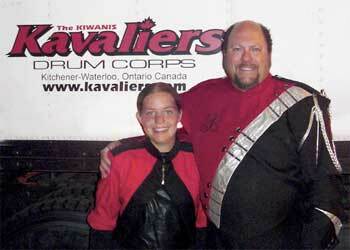 "This is a picture of my step-daughter (Lizzy Buening) and me (Don Fortner) following the Massillon show this year. She is in her second year in drum corps, having performed in the pit with the Marion Cadets in '04 and the Kiwanis Kavaliers in '05. I marched with Phantom Regiment in '80 and '81, and after 24 years off, decided to march again, this time with the Syracuse Brigadiers. It's great to be passing along the tradition to the next generation!" Thanks Don! E-mail your best shots from the summer to dave@dci.org along with where and when the photo was taken. Send some biographical information about yourself as well. We'll give you full credit. Also, let us know if you want your e-mail address included.